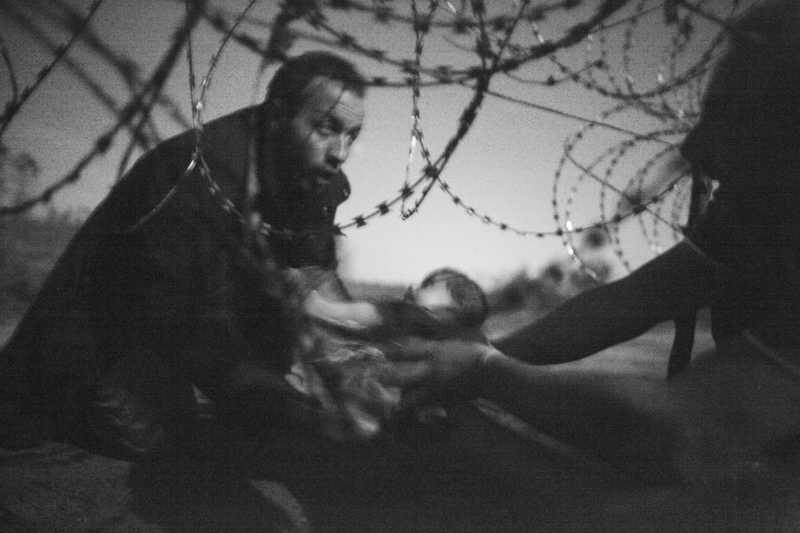 Haunting Photo Of Migrants Takes World Press Photo's Top Prize : The Two-Way The winning image, taken by Australian photographer Warren Richardson, shows a man passing a baby through a razor-wire fence at the Hungarian-Serbian border. A man passes a baby through a barbed wire fence at the Serbia/Hungary border in Röszke, Hungary, on Aug. 28, 2015. Richardson took the photo in late August in Röszke, Hungary, which is on the border with Serbia. Hungarian police have routinely cracked down on the massive flow of migrants fleeing from Syria, Iraq and other countries. "It had such power because of its simplicity, especially the symbolism of the barbed wire," general jury chair and Agence France-Press photo director Francis Kohn said in a press release from World Press Photo. "It's subtle, and shows the emotion and the real feeling from the deep heart of a father just trying to hand over his baby to the world he was longing to be in," adds jury member and director of new media development at Xinhua News Agency Huang Wen. Richardson describes the experience of covering border crossings in this area over the course of five days on his website: "There were men, women and children, amputees, the sick, all with stories to tell about where they had come from and where they wanted to go." One night stood out, he says. "There was a group of Syrians hiding amongst the apple trees on the Serbian side of the border with Hungary, their challenge was to put as many people under the newly constructed razor wire fence. In the group there were some ten engineers that had taken a good look at the fence to see where they could cross so that they could get as many of their friends and family members into Hungary." "Like a finely tuned machine, they played cat and mouse with the Hungarian police. The police would come and go from near where the Syrian group was hiding. Each time the police showed up, they would try to fix the fence so that people would not go under. But each time the police would leave, the Syrian engineers would make another hole so that they could help as many people as possible get under the fence. The police continually returned to the same spot, but this time they were a little more verbal and angry. The police attempted to fix the new holes that the Syrian engineers had made. The police were yelling into the darkness in broken English, 'do not come illegally into Hungary, go away we do not want you here, if we catch you, you will be arrested.' They proceeded to spray pepper everywhere to prevent anyone from using this particular spot. Again the police moved on to check other areas they were having problems with. Once again the Syrian engineers, with tears in their eyes from the pepper spray, created another hole in the fence to allow more people to move forward into Hungary to get to Germany, as this is where they desperately wanted to be. Four hours on from when they started, they had helped more than 200 people go under the razor wire fence. Once everyone had passed under the fence, the Syrian engineers said their last good byes to me, and left as they were the last ones to go into the darkness of the night." It's not clear if the man depicted in this photo was among this particular group of engineers. But it gives a sense of the atmosphere where this photo was taken. In a press release from World Press Photo, Richardson says the photo was taken by moonlight, because a flash would give away their location to the police. Richardson, who is currently based in Eastern Europe, says on his website that his next project will involve walking to the Arctic Circle.